For more information visit page "What's New"
Quick Reference Chart - Click on the section that you want to visit. Welcome to my Web-Site which is dedicated to scale 1/72 and 1/76 military modeling. Many people have hobbies and enjoy collecting all sorts of items, so not surprisingly, there are also people who collect items from World War 2. In my childhood I started building and collecting the well known cardboard construction kits and at a later stage, models of wooden ships and finally militairy vehicles. After my tour of duty in the Dutch Army, up to about the age of 30, I didn't do any modeling. Then by coincidence I came into contact with people who were into military modeling. After a period of building hobbyshop kits, I took up building-from-scratch based on available shop kits. 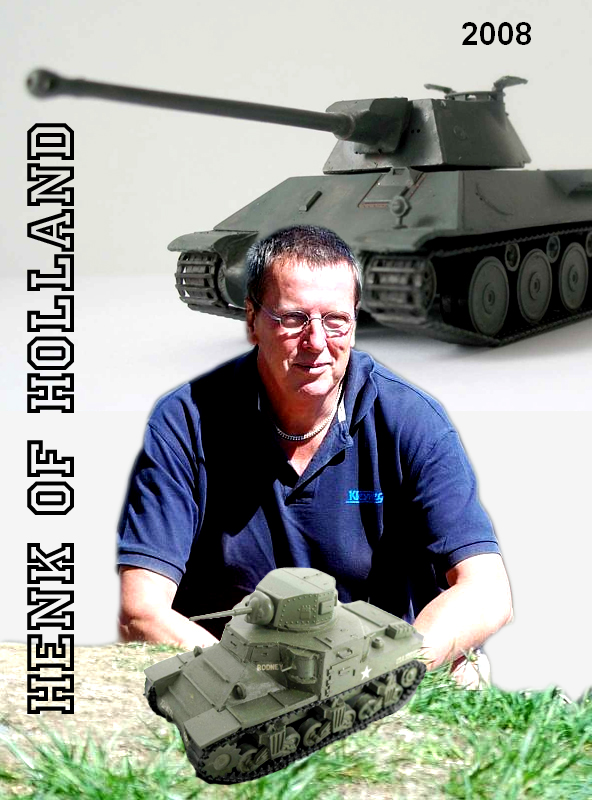 During an exposition of my models in "The fortress of Hook of Holland, The Netherlands", I became a member of the modeling club "TWENOT", which is a Dutch abbreviation of the "Second Dutch Organization of Tank hobbyists". I got so much feed back from this organization, that I began to build high quality models, resulting in several foreign companies becoming interested in my models. I came into contact with some manufacturers, specifically in Scotland, the U.S.A., Germany and Australia. I have had business deals with some of these companies. The models I built at the request of these clients were eventually released by these companies. I also built on request for private people. I have built several models for a compagny named "Ostmodels" in Australia, with a market in Australia, Japan and the U.S.A, and for a compagny named "Milicast" in Scotland, with a market in Europe and the U.S.A. The other compagnies were Mr Panzer in Italy, Fine Cast Models (FCM) and Fine Scale Factory (FSF) both in Germany. These models were built with the help of drawings, photographs, blue prints, etc. After a master model is finished, it is sent to the ordering company. The individual parts are then made on a casting strip after which a mould of silicone rubber is made. This is almost the same material as used by dentists to make dentures. By pouring liquid resin or melted soft metal into the moulds, the individual parts of the kit are casted. Casting with resin is very tricky because air bubbles can easily destroy the parts. Casting with soft metal is less difficult but weight restrictions make it too heavy for airmail shipping. You can make only a restricted number of castings from one mould. When the mould is too soft it may last longer, but the finished parts tend to be distorted. When the mould is too stiff, the mould could easily be destroyed while removing the parts. On average a mould will last for about 20 or 30 castings. Silicone rubber and liquified resin are expensive. The entire process of casting and preparing the finished item for transportation is quite time consuming, hence such products are expensive, much more expensive than the common plastic (assembly-) kits available in hobby shops. Those kits are made using injection metal moulds and will last for thousands of castings. However a proper metal mould will costs anywhere from Euro 10.000 to Euro 100.000 or even more and many thousands of models need to be sold to make it profitable. This is obviously out of range for a hobbyist. A few years ago I stopped making master models altogether, leaving that kind of work to a new and younger generation. Over the years I began to realize that there was a significant absence of useful detailed information about military modeling at the small scales' level such as availability and quality of models and the history behind the actual vehicles that they represent. I am aware that much info can be found on the internet but it is often scattered over many different sites that makes searching for it more complicated. In other words: where do I find what I am looking for? Not all manufacturers have their own website and the info available in most online shops is often rather limited. With this in mind, about 15 years ago, I started my own website with the intention to provide additional information all in one and the same site. My site was built and is maintained with the support of modelers, manufacturers and shop owners and has steadily grown over those years to what it is today. A rather unique collection of inside information in general, instruction manuals, contributions of photo galleries of finished models from all over the world and much more. This website is a showcase of my modeling hobby. IMPORTANT NOTE: "Copyright / SOURCE"
Some models on my website shows photo's of original vehicles as evidence that those vehicles have actually existed or are maybe fake vehicles. Those pictures are obtained from other modellers etc. or found on internet. Unfortunately, an owner of the copyright-related photos is usually not known. My apologies for that. Notify me if you have recognized one or more of these photos as your property, so that it is possible to mention the copyright / source of the pictures. Thanks for your attention.Henk Timmerman, alias Henk of Holland. Accessoires, barrels, shells, Photo Etching Sets and "Diorama" accessoires etc. RB-Model - Turned brass/aluminimum barrels, shells / ammonutions etc. "Review French FCM 2C / Master ready and in production by Ostmodels Australia"
Fine Cast Models, Germany "German Armour". Fine Scale Factory, Germany "Mine Clearing System "Aunt Jemina". Giesbers-Models, The Netherlands "British and Dutch Armour". 1920 Rolls-Royce "Silver Ghost" and "Fordson". Other "Die-cast" kits in scales 1/76 and 1/72, which are built & painted "in Order"
Pictures of vehicles from various countries. Also providing information which models and their possible variants are available on the market. British Infantry Tanks Valentine and Matilda II A12. Russian Light Tanks, Vehicles and others. German Panzer SdKfz.250 Halftrack Variants. German Panzer SdKfz.251 Halftrack Variants. German Panzer V Variants - "Panther"
V2 Rocket with Tractor and Trailer, Launching site, Launchcontrol Sd.Kfz. 7/3"
German 38(T), Hetzer and 38D Variants. German Heavy Tanks, Prototypes, VK4501(P), VK4502(P), Maus and E-Series. "Overvalwagen". A site with information about vehicles used by the K.N.I.L. in Dutch East-Indie. South African Marmon-Herringtons in service with the K.N.I.L. Revell GMBH page 2 - "The scale 1/72 kits"
Revell GMBH page 3 - "combination sets and scale 1/76 ex-Matchbox kits"
A picture show of finished models and diorama's built by several modelers with special reference to master modelers Gabriele Zenoni and Alexandru Giersch and to diorama builders Roman Skiba and Walter Hendriksma. Albert Chen from California, U.S.A.
Andy Lang from the U.K.
Joseph Reti a diorama builder from Hungary - Theme: The explosion of the No.98 tank "BERRY", "French FCM 2C"
"Great Patriotic War Museum", the Kiev, Ukraine. "Poklonnaya Gora" in memorial Victory Park, Moscow, Russia. "Panzermuseum "Parola", the Parola, Finland. "Yad Lashiryon Museum and Memorial site of the IDF Armoured Corps, in Latrun, Israel"
"After the Battle"--link to the website from "After the Battle" Series of books with military history WWII, called "After the Batlle"
"Hubert Cance"--Military Vehicles Drawings and Artwork by Hubert Cance. "Hilary Louis Doyle"--Released Books with military vehicle drawings by "Hilary Louis Doyle"
"www.mafva.net"--link to the website from "mafva.net" With information about the wellknown "Tankette" magazins - use the "Index" button - (Word / Excel). "Nuts & Bolts" Series of books on German WWII armoured vehicles, called "Nuts & Bolts"
"Tankograd Publishing"--link to the website from "Tankograd Publishing" Series of books with military vehicles. Restorate a Churchill - Modeling in scale 1:1 !! These URLs are linked to other informative and interesting websites. Kiddofspeed - GHOST TOWN - Chernobyl Disaster - Elena's Motorcyle Ride through Chernobyl and more!!
" 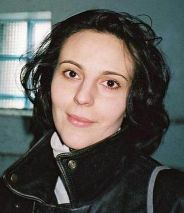 Elena's website translated into 13 different languages. Available languages are French, Italian, German, Dutch, Czech and Slovakian, Portuguese, Finnish, Spanish, Serbo-Croatian, Polish, Turkish, Hungarian, Indonesian. More languages will be available in time. Note: This website is not in line with military modeling, but I think it may nevertheless be of interest to many people. The site features video's about the disaster. Also quite interesting is the page with authentic war photographs and video's of battlefield archaeology. "Atlantikwall" Bunkers. British Website with many links to bunkers. "Modeling the Sherman Tank in 1/72nd Scale" Doug Chaltry's website. His site features most of the Sherman variants and their kits available in scale 1/72. "Modeling the F.R. Batterie (Long-Range Rocket) - scale 1/32" Albert Koopman's website. This Dutch website features the A4/V2 batterie and the vehicles used with a lot of pictures, information and the locations were the batteries were positioned. "Railwaygun Webmuseum" Nicholas Robinson's U.K. website about the Railway Gun Museum. The site shows you railway guns, armoured trains and military railway stock from different nations. "Truck Lend-Leased to Russia" Oliver Missing's German website about "Lend-lease Vehicles". Drawings in color of "lend-lease" vehicles used in Russia. "WW2 Drawings""WW-2 Drawings" Vincent Bourguignon's Belgium website with drawings in color of WW-2 vehicles from various nations. "The Tankmaster" An amazing website about Russian armor. Many high resolution images of Russian and Soviet armor and artillery in color and black and white. It is also a retail site featuring high quality resin kits made in Russia. Featuring MajorModels, OA, SK (Russia). "On the Way" Specialised in scale 1/72 modeling. Best site for information and reviews about military models in this scale!!! "Primeportal", Walkarounds and pictures of original military vehicles. One of the best sites for information and pictures of original military vehicles and more!!! "Chars Francais" French tanks and armored fighting vehicles. Site in English and French featuring vehicles either developped by the French war industry or foreign vehicles used by the French army, from start to present day. Over 150 vehicles covered. Over 450 individually identified tanks. "Vincents Abbott Galery" Site with a lot of information about military vehicles and radio-controlled vehicles. Visit the sections "Hobbies" and "History" and see the pictures and video's. "Silicon Valley Scale Modelers" A site with references and walkarounds of original armored vehicles by Vladimir Yakubov and others.Time span from 1915 until present day. "Surviving-Panzers" Site by Pierre Olivier from France. Information about remaining German Panzers from period WW-II with pictures. "Peter Shaw's Dora" Military Modeling in scale 1/6 A slide show by Peter Shaw, featuring his German "Dora" Railway gun in scale 1/6 scale. "Masterwork in 1/144 Scale" Missing Lynx shows you a built-from-scratch scale 1/144 TIGER-1 tank [Panzer in German] as used by s.Pz.Abt. 501, Tunisia, December 1942 - January 1943. "Military Vehicles in YouTube" YouTube features some interesting movies about military vehicles and models. "Strijdbewijs.nl" Strijdbewijs.nl Dutch website with plenty of WW-2 related historical information: D-Day, Operation Overlord and much more. In Dutch and English. Tank Museum Bovington, UK - Several interesting movies available at YouTube. Great Sounding Turbo Diesel Challenger Tanks. Project Landcruiser P 1000 "The Rat"
Here I would like to take the opportunity to express my appreciation to all people who have helped me by contributing information over the years. There are just far too many people to mention everyone by name personally. - Attack Hobby Kits s.r.o.